When less (roof) is definitely more. 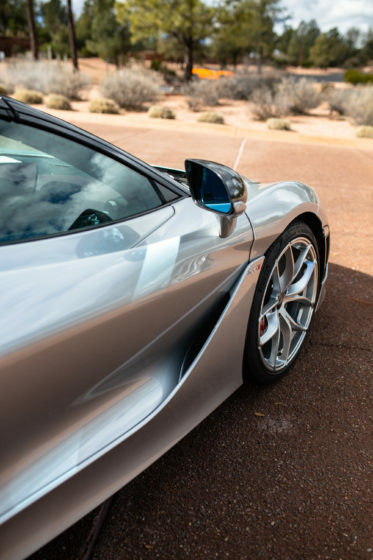 In its original coupé form, the McLaren 720S is nothing short of a staggeringly good supercar. It is wondrously fast, endlessly capable, and entirely easy to drive. After having driven the coupé all over Los Angeles, perhaps the only drawback is that, for a supercar, the experience errs on the clinical. If the 720S were a monster, it would be an all-knowing alien presence or perhaps a sentient robot, certainly not a rampaging giant lizard or an ageless vampire. So, the question becomes, how can McLaren take a car as impressive as their 720S and spice up the soul? As it turns out, removing the roof is an excellent option. 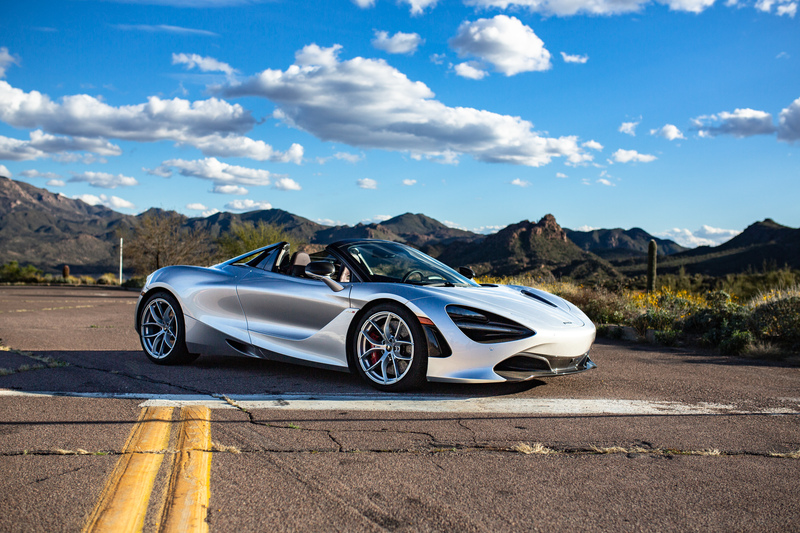 The new McLaren 720S Spider tackles the formidable task of making a convertible version of a high-performance vehicle in the hopes that putting the top down will add to the experience without detracting from the dynamic ability established by the coupé. 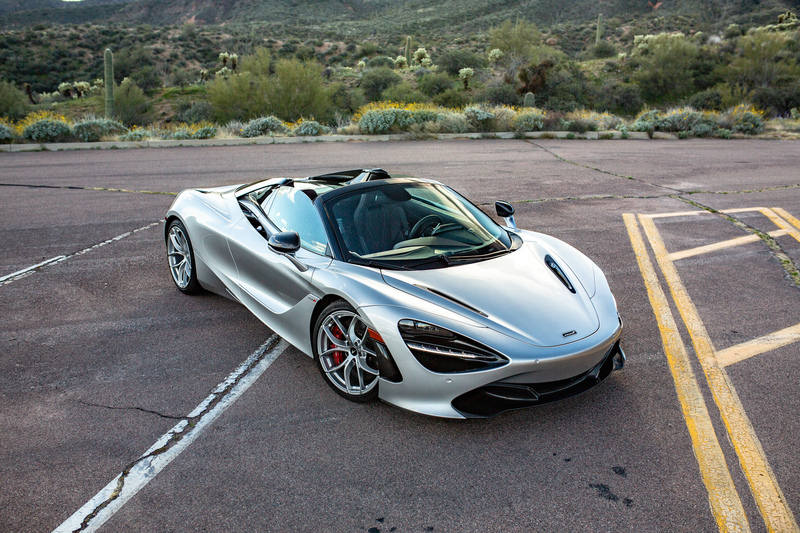 If the 720S were a monster, it would be an all-knowing alien presence or perhaps a sentient robot, certainly not a rampaging giant lizard or an ageless vampire. One thing is for certain: the Spider looks every bit as good as the coupé, and maybe even better when the top is down. 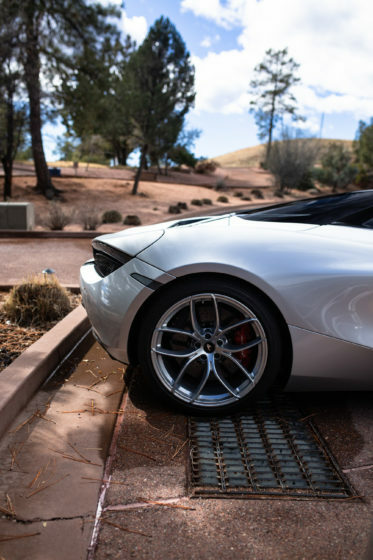 With a new rear deck lid with flying tinted-glass buttresses, the 720S Spider looks incredible. Its low-slung curves are crossed with a spaceship-like design that wraps around a glass cockpit with an optional electrochromic roof that tints dark at the press of a button. With the top up, the cabin is nicely laid out, beautifully crafted, and offers excellent visibility both front and back (thanks again to the glass buttresses on the decklid). But, let’s get real. I didn’t come all the way to Arizona to drive this supercar with the top up. I’ve driven many cars with retractable folding hard-top roofs and the 720S Spider’s is a next level implementation. Not only does it retract in 11 seconds and at speeds of up to 49 kph—with just the press of a button—but the action is unusually quiet. 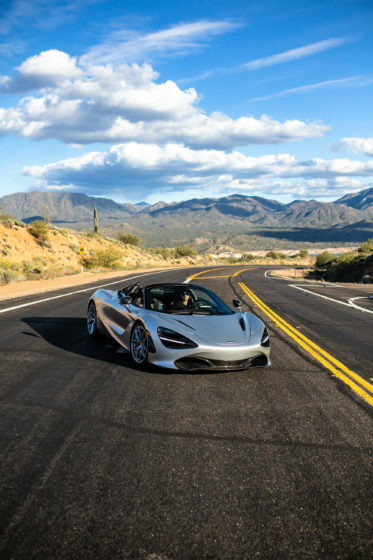 Finally, the entire roof system adds only 108 pounds to the total weight of the 720S, making the 720S Spider the lightest entry in its class. And let’s not forget the torrent of power that is on tap to deal with that weight. The 720S Spider uses the same 4-litre twin-turbo V8 as the coupé to push an addictive 710hp and 568 lb-ft of torque to the rear wheels. 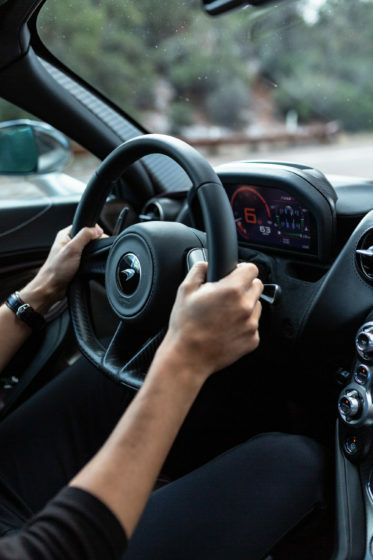 In actual road use, those numbers mean a sub-three second 0-100 kph and on the way to a 7.9-second sprint to 200 kph, and it feels even faster with that top down as the roar of that V8 feels all the more directly connected to your right foot. It’s an astonishingly fast car and the drop-top makes it feel even faster. Those of you with a lot of convertible experience are starting to wonder, how does it drive? Any convertible can be fast, and many have a trick folding roof, but does the removal of the top spoil the razor-sharp feel of the 720S? Thankfully, at least on road, not in the least. For those that don’t understand the general concern, the issue is rigidity. A proper handling car requires a stiff chassis that allows the suspension to work without interference. Any unresolved flex or twist in the body will make the suspension work less effectively and compromise the road handling of the car. Typically, when automakers remove the roof of a car the chassis becomes too twisty and wobbly (technical terms, I know) and the sills and floor have to be reinforced to stiffen the skeleton of the vehicle. This reinforcement adds weight, which also compromises all aspects of performance. For the 720S Spider, McLaren uses their cutting edge Monocage II-S, giving the car a carbon fibre core that is both light and very rigid. Thanks to this advanced monocoque design, no reinforcement is needed when removing the roof. 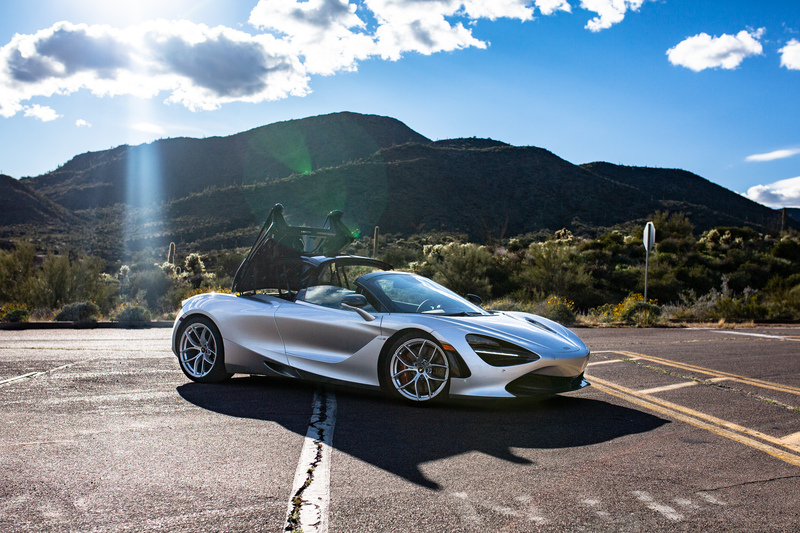 Starting at $350,000, the McLaren 720S Spider does exactly what it needs to do by taking a truly excellent performance car and removing the top for all of those romantics that are in it for the feels—those that want some sun, air, and sky wrapped up in their supercar experience.